When I arrived, I asked if they had available stock for the DVR. A young Chinese chap attended to me and assured me that they did. And when I asked what their warranty policy for the unit was, he replied that if I didn’t do the installation through them, there would be no warranty at all. Of course, I could understand that if I damaged the unit while attempting a self-install, I shouldn’t expect the liability to be on the seller. But ZERO warranty? I then asked him, what if the unit failed immediately when I took it back home, and even before installing it? Wouldn’t that be unfair to the consumer to have no assurance of quality at all on a merchant-sold good? What??! Fine…. I walked out of the shop and made a mental note never to patronise them again. Quickly, I went Carousell searching, and found another seller. Hopped over to Bisado Technologies at Kallang Pudding Road, and the experience was way, way better. I met the owner, Jason, who not only assured me that they have a 6-month warranty on the unit, but also took the time to run me through how the “smart” power unit of the DVR worked. 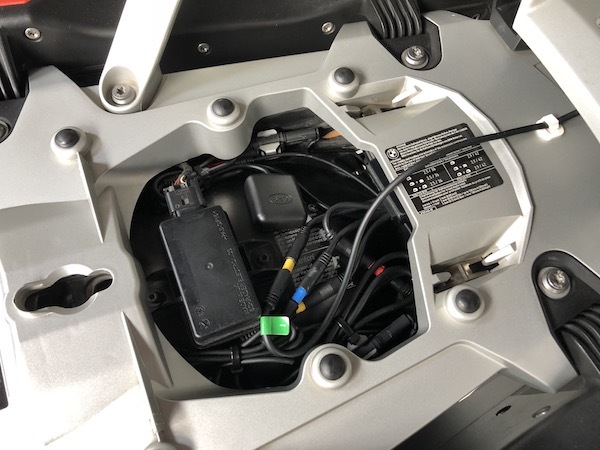 The whole install process, while wasn’t too difficult, took me about 2 hours – with most of the time spent routing the wires neatly through the R1200GS. 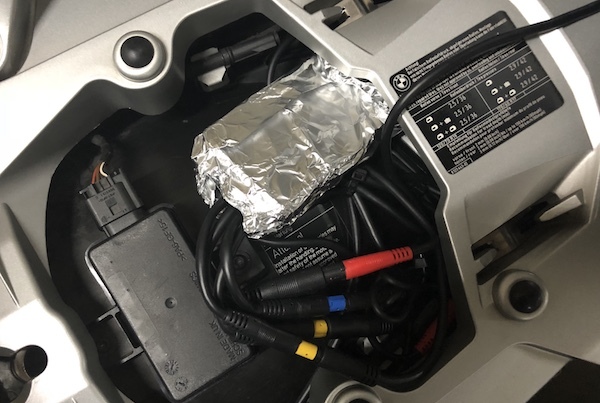 Unlike the Pulsar 200NS and Honda CB400X I previously DIY-installed the DVR on, BMW seem to like packing things so tightly that made it quite a pain to route additional wiring through the motorcycle. But once done, the end result is actually quite neat! I got myself the highest-tier set. Comes complete with DVR, “smart” power adapter, a wired-controller, and a GPS receiver. Can you spot that front camera there? The rear full-HD camera goes under the OEM top case rack. 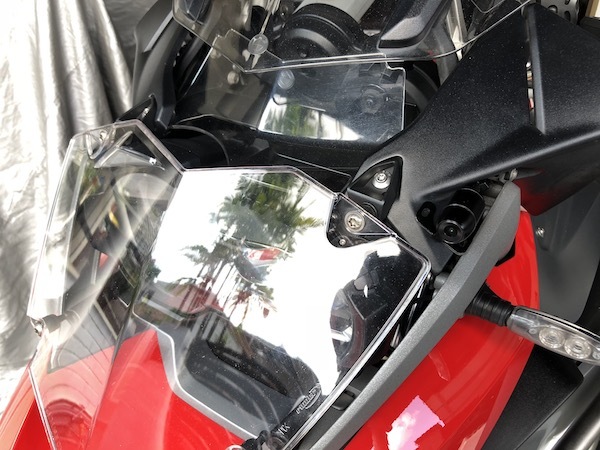 Had to make sure the off-road headlight protector – when installed – won’t get in the way of the front camera. The DVR unit, the power unit, and most of the wiring are packed under that generous space under the pillion seat. The wired remote controller installed to the handlebar. That extra little red switch is for my fog lights. The main unit tucked neatly away. The DVR unit draws power from my relay-switched power setup I previously installed. I kinda like how neat the wiring here is. At $238 for the set, it is not the cheapest DVR in the market. But it’s a dual-channel, full-HD, wifi-enabled, top-speced motorcycle DVR. With the number of idiots plying the road these days, I’d like to think of this as cheap insurance. 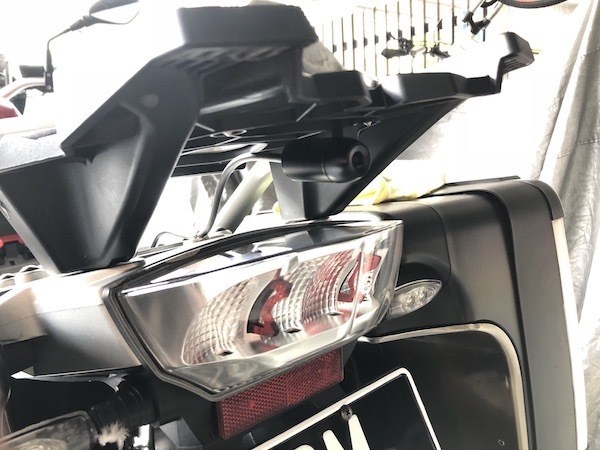 UPDATE 30 MAR 2018: I’ve found that the unit, when placed in the space under the pillion seat, interferes with the R1200GS LC RDC (tire pressure monitoring) readings. 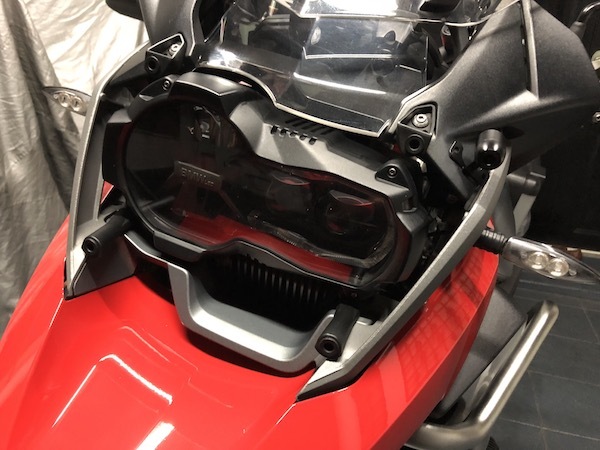 While it used to take just a couple of minutes to obtain pressure readings on the electronic dash, with the DVR installed, it takes up to 30mins of riding before the readings become available – sometimes longer for the rear. I tried every method including trying to create an EMF shield out of aluminum foil. And eventually discovered…..
…it was the GPS module! Removing it solved the RDC interference problem! My feeble attempt to create a Faraday’s Cage out of aluminum foil. 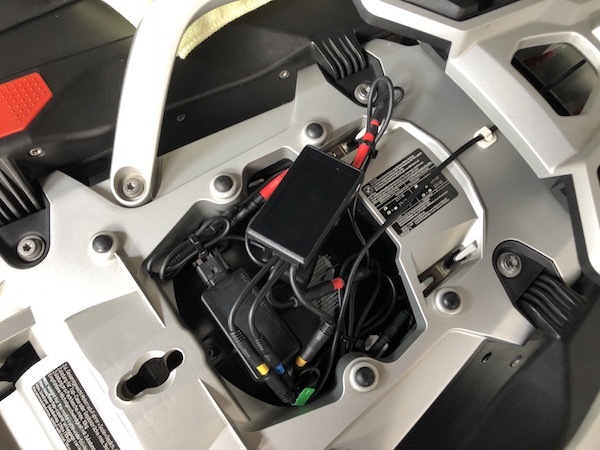 So if you’re riding a GS, have a DVR installed and getting no / poor RDC readouts, try removing the GPS module first. It might just help! UPDATE 2, 16 APR 2018: Nope, it wasn’t the GPS module. I still had intermittent RDC non-readings for the rear wheel. 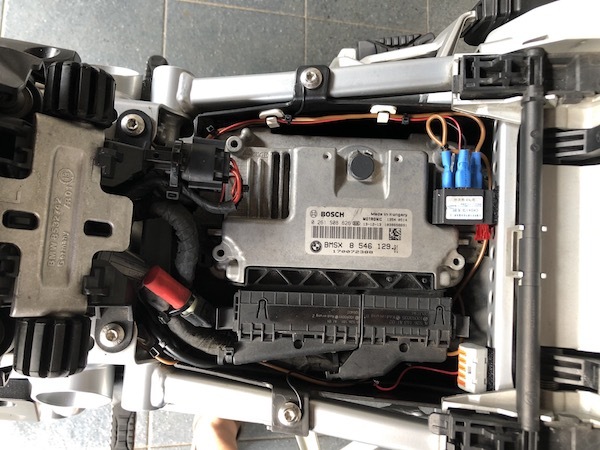 I tried playing around with the area where the DVR unit and the power unit was placed under the pillion seat. 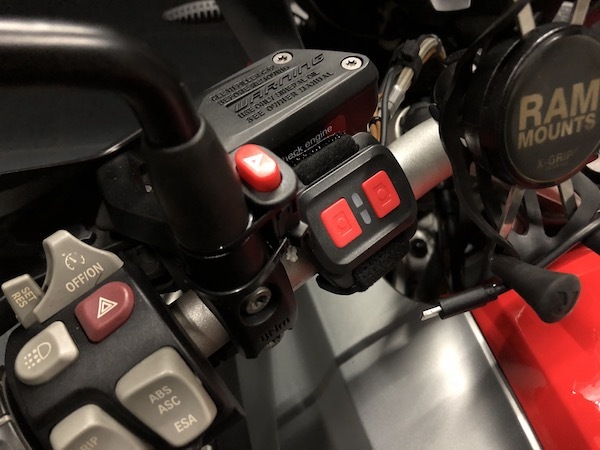 Realised that it actually seem to work BETTER with the units placed closer to the RDC module (that little black box you see there) than having the DVR neatly tucked further behind the bike. YMMV. Wow, nice job and setup! And nice blog post! first of all, thanks for sharing your nice job. 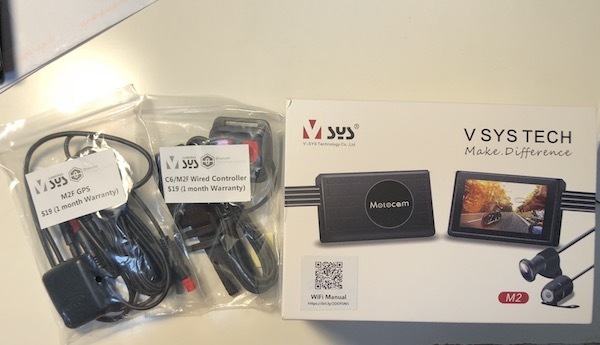 I got my Vsys cams a couple of days ago, and now i’m wondering about the best place where to mount the front cam. I saw where you mounted yours, but i think vibrations on that part may be a problem; so i’m thinking to set it in front of the small “led radiator” just below the headlight. Did you made a video, so i can see the real effect of vibrations? Check out the first 18s of the video. Note that the first 13s are actually “zoomed in” (cropped, actually) and will magnify any vibrations or movements that you may see. 14s-18s are “full framed” from the front camera. Vibrations seems acceptable; i’ll try my solution and let you know about the result. Good luck! Looking forward to hearing the results of your setup! Also for me, it took about 2 hours for a proper cables setting. The place i choose for the fornt cam isn’t the best (some vibrations are visible), but better than i expected; for now, i’m happy with it. Ah! That’s great! I’m sure you’ll love the cam! Have fun with it! Hi, I just bought the same. However when I remove the sd card and plug into mobile phone (Note 3) it does not show the videos. do u have same problem? Nope. My vids turn out fine. what phone are u using? even if I insert the sd card manually inside the phone. the videos still doesn’t show up. Have you tried playback on a computer? can i check if the dvr connects to relay and relay connects to the battery. Does the dvr by any chance connect to a fusebox and is it required? Also a wired switch, what is this and how does it help? Question is – how would YOU like to connect it up? There are probably a dozen ways to wire it up. The way I did it is but just one of the ways. If unfamiliar, send it to a competent workshop. Would like to connect it in the sense that when ignition on and riding it starts recording. understand some ppl connect direct relay to batt and some through a fuse box? To do that, you need a relay that switches on when then ignition is turned on. You’ll need to tap the signal wire on the relay to an existing ignition-on switch wire. The relay then, in turn, turns on a second circuit that connects the battery to your camera with a fuse box in between. I did experiment with switching off the WiFi on the DVR – didn’t make a difference in my case and I was still experiencing the same interference. Can you let me know how long the camera records for before it writes over again? Is the GPS function useful? Do you refer to it very often? Any other issues other than the ones you mention here? The length of recording depends on the size of the microSD card. I don’t use the GPS as I’ve always found it iffy. The DVR appears to interfere with my phone’s GPS reception – despite the WiFi turned off. All in all, I would NOT recommend this particular DVR on the R1200GS. Thanks. What size card do you have and how long is the recording using it? I have a 64gb card. Never calculated how long it could record for, but for my typical use, it loops after several days (about a week, actually). Hi, are you still having the interference problem with RDC? Do you know if it is the capacitor unit or DVR that causes the interference? Many thanks in advance. I’m not sure what a capacitor unit is – but if you’re referring to the power supply unit, I’m can’t be certain. There’s no way for me to troubleshoot if it was the power supply or the DVR unit that is causing the interference. While it no longer messes with the RDC after my RDC sensor replacement, the DVR is messing with GPS reception on my mobile phone. That I am positively certain as I now wire a switch to the DVR, and I ALWAYS get better GPS reception when I turn the DVR off – so much so that I now leave my DVR turned off most of the time. Pardon me, RDC replacement, as in tyre sensor replaced? Or the entire RDC module ( the black rectangular block under your backseat )? I have the same of RDC non-detection, for the front tyre though. What complicates in my scenario is that I have HexEzcan and X1F ( earlier version of M2F ) running. I replaced the RDC sensor unit that sits inside the wheel. The batteries in them tend to deplete around the 4yr mark or so.